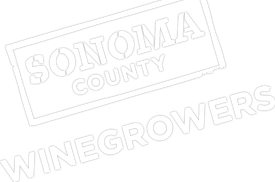 Sonoma County Winegrowers are proud to be a part of this collaborative and innovative effort to share our water conservation practices utilized for decades by our grape growers to reduce water use. Considering more dry years are a possible reality, community leaders, agricultural leaders and the North Bay’s largest employers joined together in an unprecedented effort to expand the urgent summer water drought outreach by the Sonoma-Marin Water Saving Partnership. The Sonoma-Marin Water Saving Partnership is made up of all water districts in Sonoma and Marin Counties and the Sonoma County Water Agency. “We can’t just hope for rain next year and keep watering our lawns today in the face of overwhelming evidence of climate change,” said Cynthia Murray, CEO of North Bay Leadership Council. Members of the newly formed North Bay Water Sustainability Coalition include the North Bay Leadership Council, Santa Rosa Chamber of Commerce, Sonoma County Alliance, and the Sonoma County Winegrowers. As part of their agreement, each coalition member agreed to utilize resources within their respective organizations to galvanize public attention with urgency messages during the hot summer months to create momentum so that water conservation is top of mind and becomes normal, everyday behavior. “We hope people five years from now will think it’s crazy to even consider installing a lawn in the front yard or taking a shower lasting more than 5 minutes,” explained Santa Rosa Chamber of Commerce President Johnathan Coe. The Coalition will be unveiling major initiatives at a 12:00 noon launch event held tomorrow- Thursday, July 9, 2015 as part of a larger drought awareness day tomorrow with the City of Santa Rosa. The public is encouraged to come pick up their free Drought Tool Kit at the Drought Drive-Up Event that include free low flow shower heads, faucet aerators, leak detection kits, a Friedman’s Shower Bucket and more at the City of Santa Rosa Drought Drive-Up event hosted and sponsored by Friedman’s Home Improvement and the City of Santa Rosa Water Department. The event will take place from 11:00 AM to 1:00 PM in the south parking lot and inside of Santa Rosa Friedman’s Home Improvement located at 4055 Santa Rosa Avenue. Additionally Friedman’s is holding a rain water harvesting clinic and will answer questions on topics such as drought resistant landscaping, drip irrigation and other topics. Following the press conference, members of the media will be invited for a special tour at D & L Carinalli Vineyards for a look at the innovative use of technology to achieve substantial agricultural water savings. Sonoma County Winegrowers President Karissa Kruse will highlight how business and agriculture are already taking significant steps to apply technology and future water resource planning to their business plans. “There are a lot of myths around water use and what both business and agriculture are doing in water conservation. We hope this coalition’s efforts can also publicize the facts about actual water consumption versus common myths,” said Kruse. Speakers at the press conference include Sonoma County Supervisor and SCWA Agency Director James Gore, Santa Rosa Mayor John Sawyer, City of Santa Rosa Water Department Director David Guhin, Press Democrat CEO Steve Falk, Friedman’s Home Improvement CEO Barry Friedman, North Bay Leadership Council CEO Cynthia Murray, Santa Rosa Chamber of Commerce President Johnathan Coe, Sonoma County Alliance Executive Director Brian Ling and Sonoma Winegrape Commission President Karissa Kruse.